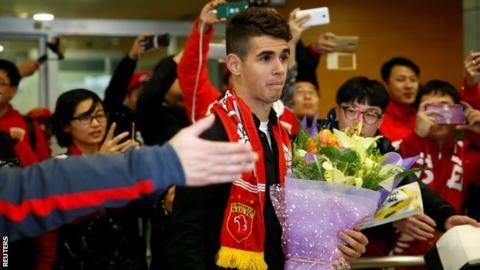 Brazilian midfielder Oscar scored on his debut for Shanghai SIPG following his move from Chelsea for a Chinese transfer record fee of £60m. The 25-year-old netted after coming on as a second-half substitute in the 2-1 friendly win against Saudi Arabian side Al-Batin in Doha, Qatar. Oscar later won the free-kick from which Lu Wenjun struck the winner. "I only trained for two days," he said. "This is the start of a new season - we have only one goal, which is to win." Oscar added: "My team-mates played very well today. The Chinese guys tried to help us [to integrate]. It's difficult to have a good game in such a short time - they made it happen." The Chinese Super League gets under way in March. Will China's spending hit new heights? Read more on Oscar £60m to Shanghai: Will China's 2017 spending hit new heights?